I've been on a quest over the last few months to find a way to produce my own edible mushrooms. The obvious answer --- what we did --- is to buy commercially developed spawn to start cultures in our logs. But once we have shiitake and oyster mushroom logs fruiting, it seems like we shouldn't need to keep buying the pricey spawn. Can't we save our own "seeds" and start mushrooms from scratch? The internet gives a pretty resounding "no." Most discussions tell you that you need sterile laboratory conditions to produce your own spawn, at an estimated cost of at least $1,000 to get started. Way out of our price range. 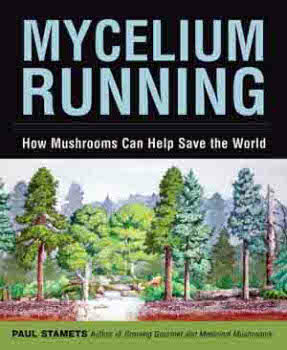 Then I stumbled across a reference to Paul Stamets' Mycelium Running: How Mushrooms Can Help Save the World. Through the wonders of interlibrary loan, I now have this enticing book in my grubby little hands. The book tells me "yes we can!" --- it's quite possible to reproduce your edible mushrooms on the cheap. I might try the ancient technique of cutting new logs for our shiitakes and placing them underneath our existing fruiting logs, hoping that spores will fall off the shiitake mushrooms and grow on the new logs. For our oyster mushrooms (and the wild morels we find in the woods), though, there are some more exact options. This week's lunchtime series will cover the most interesting techniques, the ones I hope to try this year. Stay tuned! I can't wait to hear more about the mushrooms. I haven't tried starting mushrooms yet...working on just a couple of things at a time. This year, we're getting a lot of perennial trees and shrubs started on our small property. I know that you have to dunk the shiitake mushrooms, and we don't have a good source of water yet. We're working on establishing some rain barrels which will make that a whole lot easier. Baby steps--lol. Anyway, I will let you know how the blueberry layering goes. I read in "Secrets of Plant Propagation" by Lewis Hill that highbush blueberries are the hardest small fruit to propagate. As a result, I ordered the lowbush variety. The book, "Hardwood cuttings are used by commercial nurserymen, but home gardeners usually are more successful with softwood cuttings. Rooting chemicals and a mist system are necessary...Lowbush blueberries may be increased by softwood cuttings in the same way as the highbush berries. They can also be grown from seeds taken from the ripe fruit...Wild lowbush berries layer naturally, and both these and the seedlings may be dug up and transplanted in early spring" (p. 121). There is more information about what type of soil mixture to plant this in and what time of year to attempt to do it, but that's the overall gist. Maybe a softwood cutting would work better than the hardwood cutting? Don't let lack of water deter you from starting mushrooms. We just got a 15 dollar kiddie pool at K-Mart and use that to dunk our logs in --- fill it up once and it's good to go all summer!